Appearance plays a vital role in dance. Even the best performer if not attractive and beautiful may not reach the spectator’s expectations. Dance being a performing art, the person who enacts it is expected to be presentable and smart. Sharp physical features, colourful and suitable dress, minimal but prominent jewels and appropriate makeup present the performer a feast to the eyes of the audience. Knowing these fundamentals dancers of the early period decorated themselves as per the needs of the occasion and performance. Literature, sculptures and paintings highlight the art of makeup practiced by the performing artists as well the household folk through the ages. Land was classified as per the livelihood of the people in the Sangam age as Kurinchi, Mullai, Marutam and Neytal. The hill region was recognised as kurinchi whereas pasture and forest land was named as mullai. Fertile and cultivable land with constant irrigation was known as marutam. Sea shore villages constituted neytal. Kuravai, a community dance was performed in all the four lands. Though the form of dance was same, dress, jewels and makeup differed from place to place. Flowers formed the major decorative factor at this age and were used even in the making of apparels along with grass and leaves. Dancers of kurinchi cherished in using vengai, kurinchi and kanthal flowers whereas people of mullai used flowers of konrai, vetchi, kaya, pidavam, mullai, kuruntham, kodal and kanchan kullai. Varieties of flowers along with water lilies and lotuses decorated the dancers of marutam. Garlands made out of alari flowers adorned them. Neytal flowers were used in abundance along with soft korai and thalai by the neytal girls to make their attire. Ornaments of different designs made out of terracotta, conch shell, and metals like gold and silver decorated them. Ear rings in the form of makara was a celebrated ornament of the mullai girls. Mekalai embellished with gold coins adorned the hip of the marutam dancers. Necklaces of different lengths made out of different gems such as beryl, sapphire and quartz were worn. They also had thoyyagam an ornament fixed to the hair along with ear rings and bangles made out of conch shells and gold. Their feet were decorated with silampu and padagam. Pearls and beads like cornelian and agate were liberally used to decorate oneself. Hair dressing with different types of oils extracted from medicinal plants and essences of aromatics was a common practice and flowers of excellent fragrance made them enchanting and presentable. Applying sandal paste on the chest helped them as a cover to hide the breasts. Few of them used a band of cloth for the same. Affordable ladies, residing in the palaces of the royalty and the wealthy women of the marutam used soft and fine textiles named as kalingam and tukil at the hip and used mekalai and kanchi made out of gold and studded with gems to keep the garments in place. Pearl necklaces adorned them. Males used a fine dress named kalagam. Both sexes used flowers in abundance, as the males also had long hair. Silappatikaram of Ilangovadikal portrays a celebrated dancer in Madhavi. His descriptions of her dress, makeup and jewels highlight the peak that was reached in the art of embellishment at that period. To soften and increase the fragrance of the hair damsels of that period washed it with water soaked in ten types of tuvar (karunkali, jambu etc. ), five types of virai (akil etc.) and thirty two types of omaligai (kasthuri, cardamom, etc.). Paste made out of vegetable pigments (chempanchi) helped them to paint their feet and hands. Jewels made out of gold and precious gems were worn by them from head to foot. The list of these jewels enumerated by the poet and expressed in stone forms by the sculptors of the Pallava and Pandya period prove the height of artistic skills attained by the artisans of that period. Wearing suitable attire as per the need of role and occasion became mandatory. A vivid description provided by the poet on the makeup of a young lady of the mullai region as Korravai alias Durga throws light on the expertise enjoyed even by the folk population in decorating oneself. 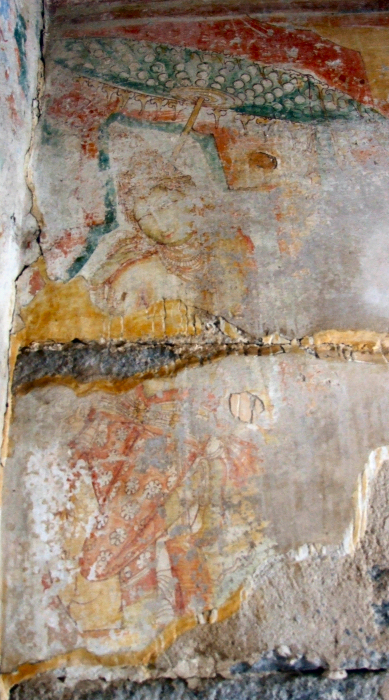 Mural paintings of Kailasanathar (Kanchipuram) and Panamalai temples, Sittannavasal and Thirumalaippuram cave temples speak volumes of physical decoration that was in vogue during the Pallava and Pandya period. Minimal ornaments, fine silk like diaphanous clothing, colourful flowers with charming facial makeup and the captivating expressions of the performing artists of Sittannavasal paintings create a virtual dancing hall for the spectators. Study of postures struck by these dancers reveal their anatomical exposition expertly handled for the gestures and movements. 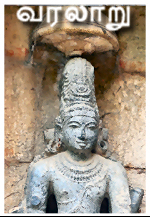 Sculptures of Vettuvankoyil at Kalugumalai and Thanthonrisvaram at Kanchipuram make excellent examples for the study of the art of physical decoration that prevailed during the early medieval period. It is a well known fact that almost all the fine arts reached their zenith under the patronage of the Imperial Cholas. Numerous epigraphical records and the literature like Perunkathai and Jivakacintamani explicitly emphasize the height that was attained by the art of dance during this period. For the first time in the art history of Tamilnadu exclusive records are available on the make up done by the dramatists to perform kutthu, a musical dance treatise. Artists used rice flour and turmeric along with gingili oil. Literature reveals nadaiyari pulavar and vanna makalir, professional makeup persons who guided and helped the dancing girls and the affordable as well as the royal ladies in the art of physical decoration. It is also known from Jivakacintamani that there were books on the art of makeup written by experts in the field. The habit of applying sandal paste to cover the breasts continued but along with that pearl necklaces of broader designs were also used. Several verses of the same literature enlist the ornaments that adorned the dancers. Aromatic compounds of different fragrance were applied in the appropriate places to make them enchanting and captivating. Hair style techniques varied as per the roles played by the artists. Flowers, sandal paste, kasthuri and varieties of powders of vegetable origin made them colourful and presentable. Dominance was achieved by the appropriate attire made out of cotton and silk. Betel nut was used to make the lips appear red. Sculptures of the Chola period available in abundance in the structural temples of the delta area distinguish themselves in the excellence achieved in physical embellishment of the dancers. Sculptures of the feminine beauty made at Nagesvara and Pullamangai temples show the aesthetic taste in opting for the decorative factors to make oneself enchanting. Though the number of jewels increased in Chola period and the variety multiplied that in no way interfered with the perception of beauty by any means. The care taken in adorning to bring out the lucid curves of the physique is enthralling. Hair dressing and arranging the plaits entered into newer venues. More than forty types of hair styles are noted in the gana mala of Avanigandarva Isvaragriham at Paluvur. Dress patterns with multiple folds and hand stitched designs enhanced the beauty of the feminine form. Painted with vegetable dyes their skin had taken a new sheen to make them cute and catchy. 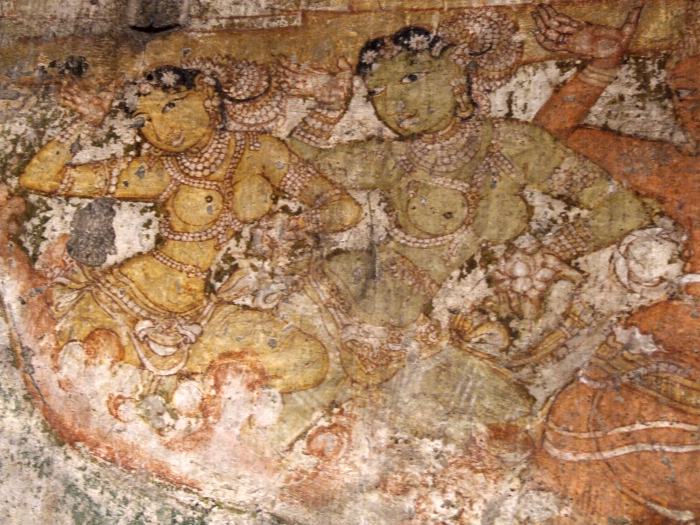 Paintings witnessed in the sandhara space of Rajarajisvaram, the great temple built by Rajaraja I, bring to light annals of decorative skill experienced and experimented by the Chola beauticians. Presentation of flowers with appropriate postures and gestures of the dancers had seen the peak in the Chola days. Jasmine, water lilies, lotuses, iruvatchi, chenpagam and even nerunchi and umattam were used to accentuate the beauty and the physical fragrance. The variety of jewels mentioned in the inscriptions and witnessed in the paintings and sculptures were studded with pearls of different kinds, red stones, diamonds, jades corals and emeralds. Making of jewels was at its peak as revealed by the presence of special and skilled stone makers attached to the temple of Rajarajisvaram. Gold and silver were exorbitantly used to make oneself charming and unique. Physical decoration an art by itself evolved through the ages with the innovative explorations of the beauty seeking mind of the ancient Tamils. Though there are a few articles available in this area, a wide angle research with an insight for search may bring out the intricacies of the art of making oneself presentable and attractive to the lime light of History and will prove the heights touched by the Tamils in it. 1. Dr. R. Kalaikkovan, Cholar Kala Adarkalai, Alamu Pathippagam, Chennai, 2003. 2. Dr. R. Kalaikkovan, Thalaikkol, Sekar Pathippagam, Chennai, 2004.